NAS-Based VM Backup Appliance: What and Why? As our world goes digital, both large enterprises and SMBs typically deal with massive amounts of data processed and scattered among a multitude of physical and virtual machines comprising IT infrastructures. If any piece of infrastructure fails, there is always a risk of losing a piece of business-critical data. Thus, to eliminate data loss, any business ultimately faces the need to back up its data and purchase a reliable storage to keep these backups safe. Depending on their business needs, they can either opt for large servers and cloud solutions, or choose a magic box called NAS. A Network Attached Storage (NAS) is essentially an intelligent hard disc box that is attached directly to your business network and can be used to keep any of your important stuff centrally in a secure place in a resilient and redundant format. The device works completely separately from your IT infrastructure, so if the IT infrastructure goes down, you will still have access to data on the NAS. All of your files are accessible all the time from anywhere at no extra cost. Many companies now have one to several NAS servers in their environments, and they have good reasons for that, because NAS servers are easy-to-operate, cost-efficient, scalable, and provide wide opportunities for data protection. NAS servers are produced by several world-known manufacturers implementing state-of-the-art storage technologies. Some of them (e.g., QNAP, Synology, ASUSTOR, and Western Digital) support turning a NAS into a VM backup appliance – an all-in-one smart tool which helps effectively protect VMs against data loss. Thus, if you possess such a NAS, all you need to do is to install specialized software (e.g., NAKIVO Backup & Replication) on this server. By doing this, you will combine backup software, hardware, storage, and data deduplication in a single device! All-in-one solution. A NAS-based VM Backup appliance is implemented as a unified system. You get an all-in-one backup hardware, backup software, backup storage, and data deduplication solution in a single box. Separation of backups from the rest of the infrastructure. A NAS-based backup appliance separates your backups from the rest of your IT infrastructure. Such separation ensures that your infrastructure resources are not consumed by backup workloads. Painless disaster recovery. Also, because backups are stored separately, in case any component or the entire infrastructure goes down, your backups remain unaffected and can be used for recovery. Backup to the cloud. To ensure that your VM backups are save, it is better to always keep a copy of your VM backup in a secondary location offsite. 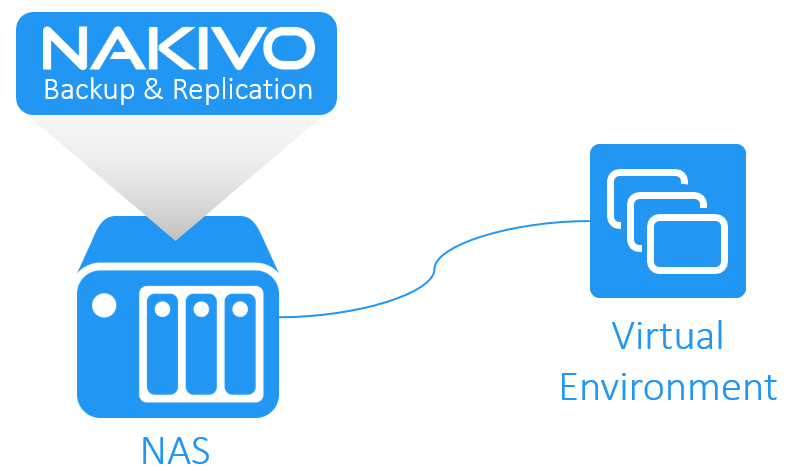 In case you don’t have such secondary location, NAKIVO Backup & Replication can automatically copy your VM backup to the cloud. High data transmission speed. Due to the fact that VM backup data is written directly to NAS disks, i.e. bypassing NFS and CIFS file protocols, you get an incredible up to 2X backup speed boost, if compared with VM-based backup solutions. Storage saving. NAKIVO Backup & Replication is supplied with Skip Swap Files and Partitions, Backup Deduplication, and data compression technologies. Once installed on your NAS, the product helps you use less storage space to keep your backed up data. Mobility You can move your VM Backup appliance offsite to any location anytime you need. This ensures flexibility in case of a disaster. Economy. Once deployed in a virtual infrastructure, the NAS-based VM backup appliance can be used instead of several data protection VMs. This allows you to dramatically lower your costs. Installation of NAKIVO Backup & Replication on NAS servers is an inexpensive and effective solution, which does not require serious investment. Therefore, using NAS-based VM backup appliances in your IT infrastructure should definitely be included into your disaster recovery plan. These appliances combine backup software, backup hardware, backup storage, and data deduplication solution in a single device. They also unload your network and hardware resources. So, this solution is highly recommended to be used by small and medium-sized businesses.